Looking for a great family outing? 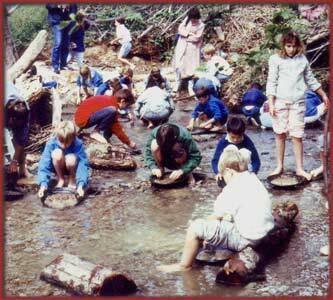 A Gold Prospecting Adventure is an exciting, educational, and fun group adventure. It's also economical, all of our adventures have special family rates, discounts are available for chidren under the age of twelve. We will make reference to a given number of pans per hour in the following text. The number used is an average, the more pans of material you process the more gold you find. We find gold on every trip of two hours or more and you keep all the gold you find. "Our Visit to your Jimtown 1849 Gold Mining Camp was the perfect lunch stop on our way to Yosemite. For a while, I really felt what it must have been like to live in the California during the Gold Rush!" 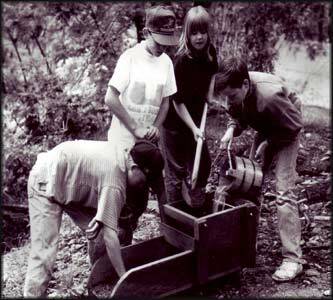 Come with your family or group and pan for gold at a real gold mining camp located on a shady, gold bearing creek in the heart of the Motherlode. Meet us at the old livery in historic Jamestown. You can't miss the claim jumper hanging in front of our store. We recommend a 3 or 5 hour expedition. Gold has always been found on guide escorted expeditions of 2 hours or more and times passes quickly when you're finding gold! The next step up from gold panning is using the sluice box. After panning a while you will soon appreciate using the Sluice Box. It is much more effective in finding gold. Best of all the water does the work for you! On this highbanking adventure you move even more material because we move the sluice box to your site and pump the water to you. This technique yeilds even more gold, and all the gold you find is yours to keep! Are you an expert or a metal detecting guru? Do you know everything about the metal detector and how it works? Have you have found some nuggets and want to learn something new? If so, then this 3-day trip is for you. In 15 hours we'll teach you how to find the "float" in the stream bed and retrace it back to it's source. Everything you need to know to become a knowledgeable "pocket hunter" is included in this trip.